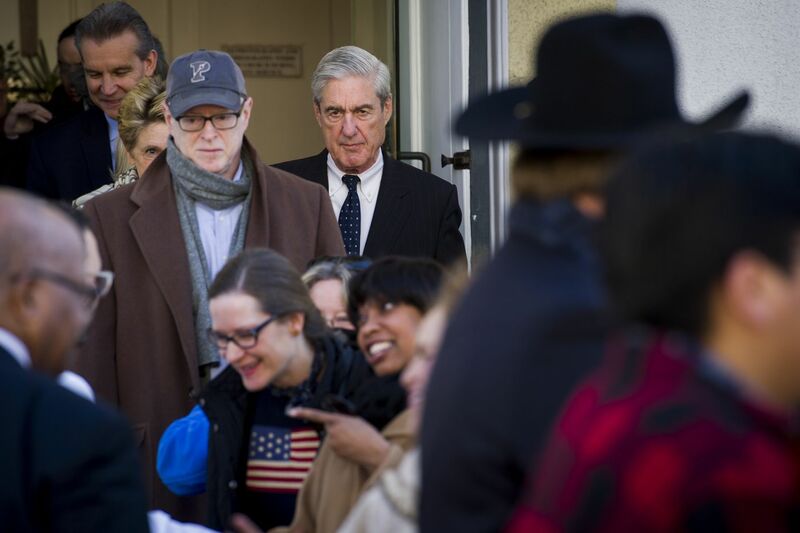 Special Counsel Robert Mueller exits St. John's Episcopal Church after attending services, across from the White House, in Washington, Sunday, March 24, 2019. Mueller closed his long and contentious Russia investigation with no new charges, ending the probe that has cast a dark shadow over Donald Trump's presidency. Mueller made no conclusion on possible obstruction of justice by President Donald Trump but found no evidence of collusion with Russia, according to Attorney General William Barr. (Bloomberg) — Special Counsel Robert Mueller made no conclusion on possible obstruction of justice by President Donald Trump but found no evidence of collusion with Russia, according to Attorney General William Barr. Barr, in conjunction with Deputy Attorney General Rod Rosenstein, “concluded that the evidence developed during the Special Counsel’s investigation is not sufficient to establish that the President committed an obstruction-of-justice offense,” he wrote. The report will be read by Trump’s supporters as clearing him of the two major allegations that have hung over his presidency — collusion and obstruction of justice — even as Democrats in Congress seem certain to assert their right to determine Trump’s guilt or innocence on the question of obstruction of justice. Barr issued the summary of Mueller’s “principal conclusions” two days after Mueller gave him his still-secret report. It was the close of a politically explosive 22-month investigation into whether Trump or those around him conspired in Russia’s interference in the 2016 campaign and whether the president sought to obstruct justice. Nothing in the Justice Department’s regulations on special counsels would prevent Barr from releasing Mueller’s report once certain material is redacted, including classified matters and information about continuing law enforcement operations. But Barr has cited the department’s policies against publicly criticizing someone who isn’t indicted — and against indicting a sitting president. Democratic lawmakers already have demanded the full report as well as the underlying evidence so they can pursue their own investigations. Trump, who has proclaimed or tweeted “NO COLLUSION” more than 200 times and has routinely denounced Mueller’s “witch hunt,” made no comment on the special counsel’s report over the weekend in Florida. He spent much of the time on his golf course with partners including Senate Judiciary Chairman Lindsey Graham. The Democratic candidates who seek to replace him in 2020 joined in demanding the full release of the report. Justice Department officials, who described Mueller’s report as comprehensive, said he didn’t recommend any additional indictments and doesn’t have any secret indictments under seal. Before completing his probe, Mueller helped secure guilty pleas from five people involved in Trump’s presidential campaign — including his campaign chairman Paul Manafort and Michael Flynn, who became his first national security adviser — though none admitted to conspiring with Russian operatives. He also indicted more than two dozen Russian hackers and military intelligence officers. While Mueller didn’t seek an indictment of Trump or members of his family, they’re not necessarily in the clear. Trump faces continuing risk from other investigations, with federal prosecutors in New York looking into his company, presidential campaign and inaugural committee. Mueller has been sharing some matters and handing off others to U.S. attorney’s offices in Manhattan; Alexandria, Virginia; and Washington, as well as the Justice Department’s national security division. That may keep alive cases that touch on his personal and business affairs. Through a series of indictments, Mueller laid out a picture of operatives and hackers tied to Russian intelligence agencies doing all they could to help put Trump in the White House even as other Russian officials had scores of contacts with people tied to Trump’s campaign. But Barr suggested during his confirmation hearing in February that he might exclude any criticism of Trump and others who weren’t charged with crimes from the information he’d share with Congress. “If you’re not going to indict someone, then you don’t stand up there and unload negative information about the person,” he said. In addition, Trump and his lawyers have indicated that before any details from Mueller’s findings are made public they want to see anything that would disclose the president’s private communications. They say they want to preserve their right to assert executive privilege, the doctrine that a president must have the ability to receive candid advice. Congressional Democrats — who now control the House — say they want broad disclosure of Mueller’s investigative work, citing the earlier success of Republicans in pressuring the Justice Department to release details they said showed anti-Trump bias in the FBI. They have talked of issuing subpoenas to force disclosure and even public testimony by Mueller. “It is imperative for Mr. Barr to make the full report public and provide its underlying documentation and findings to Congress,” House Speaker Nancy Pelosi and Senate Democratic leader Chuck Schumer said Friday in a joint statement. Mueller, a former FBI director, was appointed in May 2017 to conduct one of the most consequential investigations in U.S. history. He hasn’t spoken a word in public since then, leaving it to the indictments he’s filed to build his case. In particular, Mueller investigated Trump’s effort to get then-FBI Director James Comey to drop an investigation into Flynn, the former national security adviser. Mueller also investigated whether Trump’s decision to fire Comey in May 2017 constituted obstruction of justice. Rosenstein, the deputy attorney general, appointed Mueller as special counsel days after Comey’s firing. Mueller indicted and convicted Manafort, the former campaign chairman, for a series of financial crimes, and he’s been sentenced to 7 1/2 years in prison. He also secured guilty pleas and cooperation agreements from Flynn, Trump’s deputy campaign chairman Richard Gates, campaign foreign policy adviser George Papadopoulos and Trump’s former lawyer and fixer Michael Cohen. Mueller’s investigation cost about $25 million from his appointment in May 2017 through September 2018, according to the latest figures, provided by the Justice Department in December. —With assistance from Billy House and Steven T. Dennis.